The deaconry of the ”Fremdlingen Armen” was founded by the East Frisian countess Anna in 1553, in preparation for the arrival of parts of the London “Fremdenkirche” (strangers’ church ), who left England in a hurry because of the persecution under Mary Tudor. 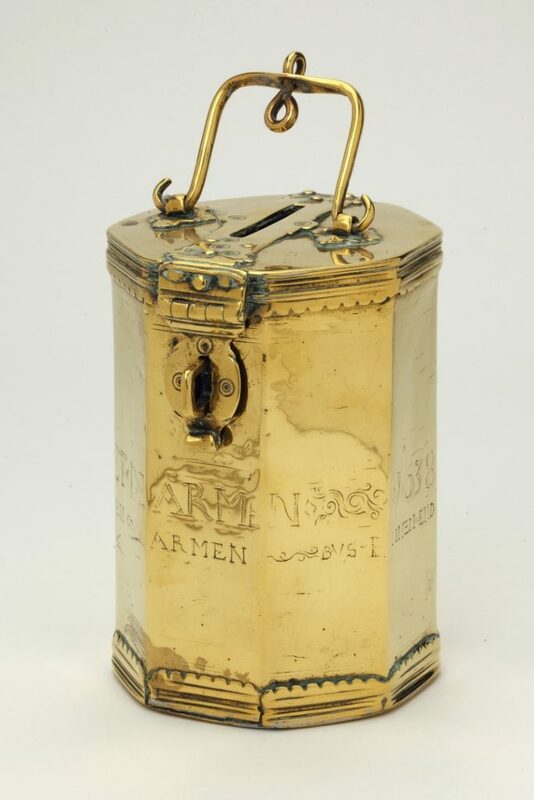 The oldest of the four remaining donation cans of this deaconry has an octagonal base and a Dutch transcription: „TH LIEFDE BEDENCKET DE ARMEN 1638 “[For charity’s sake think of the poor] and underneath: „BVS BINNEN EMDEN DER VREMDELINGEN NEDERDVITSCHEN ARMEN“ [can for the poor Dutch strangers within the city of Emden]. There is a loop riveted to the top of the can, which secures the content from theft in connection with a lock. Opening the lid there is a second protection found underneath the slit of the can. This is a hose made out of chain links, which is supposed to prevent money from being shaken out of the inner part of the can. This device is dated earlier, which can be seen from the remainders of the metal tongues, which were originally installed for the very same reason, as protection.